WELCOME TO OUR HAPPY PLACE -PAINTSKIN - 11" x 22" CREATE A FABULOUS SIGN! NEED A BOARD? - See our tip below. Home > SHOP OUR PRODUCTS > 2019 PAINTskins FOR MAKERS - NEW! > NEW! 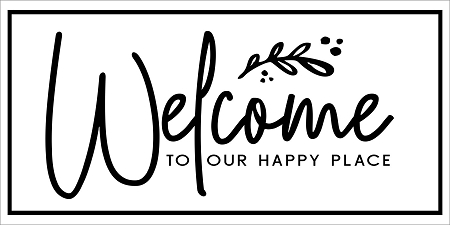 PAINTskins > WELCOME TO OUR HAPPY PLACE -PAINTSKIN - 11" x 22" CREATE A FABULOUS SIGN! NEED A BOARD? - See our tip below.